Unless otherwise noted, parts are manufactured in the following manner: fenders are supplied with headlight buckets, surface finished mounting verticals, left side gas fills, and complete mounting flanges. Quarter panels come with taillight boxes installed and complete lockposts. Specify if installation is for stock 993 or 911 conversions. Original, direct bolt on. The same fender will work for stock 993’s or Turbo’s. For Turbo applications add the Turbo Fender Extension (see below). Add on lower fender extensions allow narrow fenders to match up with turbo rockers. 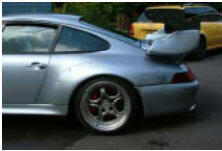 GT2 width, 2” wider per side, with turbo style fender extensions. Attaches to stock rockers and adds an aerodynamic flare. For Turbo and wide body 993. 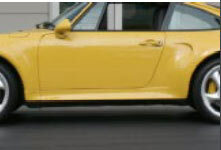 Rocker extensions attach beneath the 993 Turbo rocker panels. On GT2 conversions. For narrow body 993. Six pieces (two front flares, two rear flares, left and right rocker panel covers) total. Add approximately 1.5″ to each quarter and 1″ to each fender. GT II style flares. Originally designed to be added to Turbo width bodies. Adds approx. 2” to each quarter and 1.5” to each fender. Four piece set (2 front and 2 rear). For installation on +3”, quarters when running 28” tall tires. Adds 1” width, 1 1/2” height. 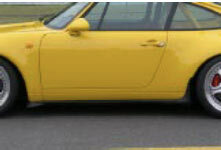 As used on the 993 Turbo S.
Original, stock width 993 rear quarter panels. Complete with rear taillight box and front lock post. 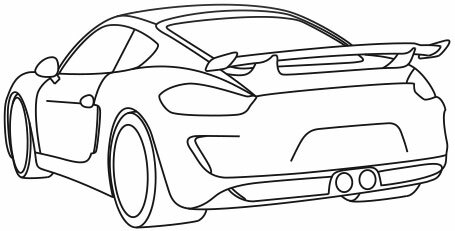 Specify 911 or 993 chassis. Original, stock width 993 turbo quarter panels. 1 1/2” wider per side. Complete with rear taillight box and front lock post. Original GT II width (Turbo quarters and GT II rear flares). Rear quarter panels, complete with lock post, taillight boxes and engine compartment mounting flange.